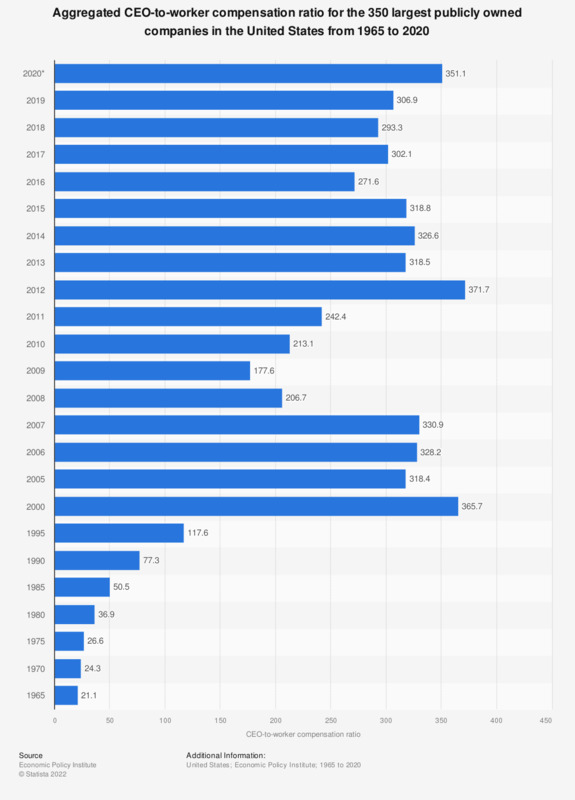 This statistic shows the aggregated CEO-to-worker compensation ratio for the 350 largest publicly owned companies in the United States from 1965 to 2016, and projected to 2017. In 2017, it is estimated that the CEO-to-worker compensation ratio will be 311.7, indicating that on average, CEOs will receive about 312 times the salary of a normal worker. *Figures for 2017 are a projection. Compensation data has been taken from the top 350 publicly owned firms in the United States for each year, ranked by sales. CEO compensation contains salary, bonuses, restricted stock grants, options granted, and long-term incentive payouts.